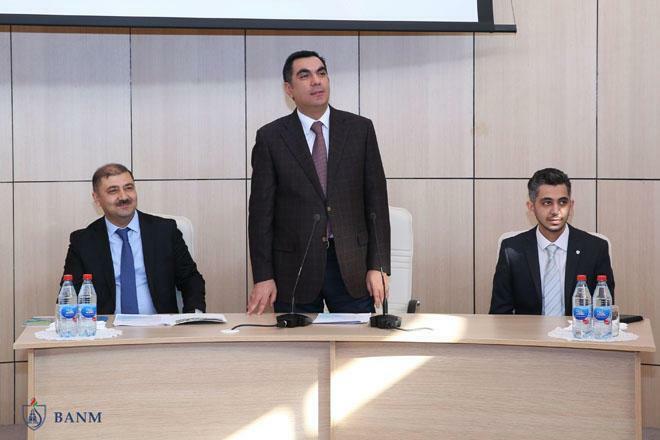 Baku Higher Oil School ( BHOS ) hosted a workshop entitled 'Basics of Remote Sensing', which was conducted by representatives of Azercosmos Open Joint Stock Company (OJSC). It was arranged to commemorate the eighth anniversary of the founding of the company. The workshop was attended by BHOS Rector Elmar Gasimov, teachers and students of the Higher School. Welcoming the workshop participants, Elmar Gasimov said that BHOS maintains a close cooperation with Azercosmos OJSC for a number of years. He reported that the BHOS student team took second place at CanSat Азербайджан 2018 contest, which was jointly organized by the company and the Ministry of Education. 'I am confident that our undergraduates will successfully participate in other projects and events initiated by Azercosmos OJSC,' said the Rector. At the workshop, the participants learned about the company main activities, latest developments and projects designed for students. The presentation covering basics of remote sensing was made by Head of Azercosmos Research and Development Centre Tarlan Mammadzade, Software Engineer of the Centre Javid Khalilov and leading specialists of the group responsible for remote sensing data processing Elman Aleskerov and Ismet Bakhishov. They told about the remote sensing program used by Azercosmos, advantages and applications of remote sensing systems and methodology for remote sensing data analysis. After the workshop, the guests toured around the BHOS campus and its facilities.